Virtual reality (VR) technology is gaining serious traction. It promises to forever change the way man and machine interact. In 2015 alone, more than $600 million has been invested in virtual reality by firms like Facebook, Google, and Microsoft. It is often thought that virtual reality technology is a novelty reserved for the computer gaming industry, but this could not be further from the truth. Virtual reality will be a game changer for many industries. Companies developing innovative ways to integrate this technology into to their operations and products will be able to differentiate themselves from their competition and take advantage of federal and state tax credits. On December 19, 2014, President Obama signed the bill extending the R&D Tax Credit for the 2014 tax year. As of this writing, proposed tax extender legislation would extend the tax credit through December 31, 2016. When people hear virtual reality, they think video games, but the opportunities for this technology are endless. The CTO of Oculus Rift, the market leader in virtual reality, predicts that gaming will eventually account for less than 50% of the time people spend using the technology. Not everyone plays video games, and those who do play, on average spend more time watching movies/videos. Global brands like Facebook, Google, and Microsoft are paving the way for VR. Facebook believes that virtual reality along with artificial intelligence and drones are the technologies of the future. Google is pioneering virtual reality by developing inexpensive VR systems such as Cardboard, a device constructed of cardboard, Velcro, and plastic lenses. Microsoft is investing heavily in VR by purchasing companies such as HoloLens, a developer of augmented reality systems and Havok the creator of a 3D physics engine used in many video games. Manufacturers of virtual reality hardware and content will have to work closely with various industries to ensure the success of this new technology. It will be similar in how PC game developers currently work with graphic processor manufacturers like Nvidia and AMD to develop games that can fully realize the capabilities of their advanced graphics cards. Like a newborn baby, virtual reality will need nourishment; this nourishment will come in the form of content. Companies at the forefront of VR technology will find it necessary to team up with entertainment companies to ensure there is plenty of content for early adopters. Currently the primary way to experience virtual reality is to wear a pair of goggles that trick your brain into thinking you are somewhere that you are not. Humans have stereoscopic vision; this means humans perceive depth by noticing slight differences between the images received by each eye. Virtual reality goggles contain two miniature screens, one for each eye. These screens simulate stereoscopic vision by altering images delivered to each eye, thus creating a false sense of depth. Simulating stereoscopic vision alone is not enough; various sensors are needed to deliver a seamless user experience. Accelerometers and gyroscopes are strategically placed so the movements of the wearer’s head can be tracked. This allows the goggles to deliver a 360-degree virtual experience to the wearer as they look around the room. These sensors are constantly relaying data so mistakes can add up. A camera is installed in the room to correct any mistakes that sensor may make as well as record body movements, which allows the user’s real world movements to translate to the virtual world. Companies that design and develop sensors used in VR systems can expect a major increase in demand for their products in the years to come. The communication between tracking systems and a processing unit is what allows users to experience a seamless virtual experience no matter where they are looking in a room. Tracking systems can use electromagnetic, acoustic, optical, and mechanical technologies to determine the yaw, pitch, and roll of the VR headset. Currently, high-end VR headsets require a camera in the room to correct mistakes made by sensors. The development of more sophisticated tracking systems that do not require a backup camera will enable VR to be more accessible, for example outside in a park or on a crowded train during someone’s morning commute. Oculus’s new headset will be able to deliver a stunning 3D experience, however the quality of this experience is contingent on the overall build of the desktop PC that will be running it. Virtual reality requires a frame rate of 90 frames per second to create realistic 3D environments. This is a far cry from the 30 frames per second that most games run on. Laptops and other mobile devices lack the power needed to simulate virtual reality. This means that a rather small demographic will be able to use this new headset. On top of this, not everyone who owns a desktop will be able to run the Rift. The Rift requires a PC that has been built within the last 12 months. The cost of a computer that would satisfy minimum requirements would cost over $1000. There are other, less capable virtual reality units such as Samsung’s Gear VR, which costs around $199 and relies on a smartphone for a screen and processing power. Cost will be one of the leading factors determining how quickly people adopt VR. Companies that find ways to reduce the computing cost of running VR headsets will gain a considerable advantage over their competition. When using virtual reality technology some people may experience motion sickness, this arises from the vergence-accommodation conflict. Normally when you are looking at something, the lens in each eye adjusts and brings the object you are looking at into focus. As stated earlier, VR headsets trick your eyes into believing something is in front of you by delivering slightly different images to each eye. Unfortunately, looking at flat lit up display that appears to be in the distance while focusing on a 3D image that appears in front of you can cause nausea and dizziness. Stanford University in California is currently working on a way to overcome this shortcoming. Stanford has developed a headset that essentially allows the user to see an approximation of the light field being generated by the backlit LCD screens contained in the headset. This allows the user’s eyes to move around freely and focus where ever they want in virtual space, which in turns makes the whole experience feel natural, reducing the potential for nausea and dizziness. Virtual reality is not a fully refined technology just yet. Speed bumps in VR technology should be seen more as opportunities to be monetized rather than major roadblocks. When someone puts on a high-end virtual reality headset for the first time their jaw will drop, but this does not mean there isn’t room for improvement. The two main complaints about VR headsets are that they are bulky and sometimes cause nausea. Using smaller and more powerful processors will solve this. Smaller processors would allow for the development of lighter and more ergonomic headsets. In addition, increasing the frame rate per second of VR headsets can reduce nausea. This cannot be done without increasing computing power. Unfortunately, it looks like Moore’s Law could be running out. Moore’s Law states that the number of transistors in integrated circuits will double every two years, but technologist now believe that next generation computer chips will start to take two and a half to three years to come out. Technologists even believe that by the middle of the next decade, Moore’s Law could even come to an end. This means that the future of VR will be heavily reliant on technological breakthroughs in computer chip manufacturing. The limits of virtual reality are boundless. VR will offer consumers a richer, more involved entertainment experience. VR will also become an indispensable tool in marketing and advertising. They say, “a picture says a thousand words”, but virtual reality requires none. Virtual Reality will also change the real estate industry. It is one thing to see pictures of a house in a video, but there is nothing like experiencing the property in person. Visiting every house in person can be costly in transportation costs and time. Virtual reality will allow people to experience properties in person while not actually being there. People may not make an investment solely on a virtual tour of a home, but it will allow them narrow down their choices. In the not so distant future, houses for sale that do not include a virtual tour may be quickly overlooked. Virtual reality sports will also be a huge market. Last month, the Golden State Warriors vs. the New Orleans Pelicans was broadcast live in virtual reality. It was the first time a professional sporting event was broadcasted using VR technology. Virtual reality will allow television networks to charge premium rates for people to be able to sit courtside while being thousands of miles away from the actual game. The best part is since these spectators are not actually taking up a physical presence, television networks can sell and an unlimited amount of courtside seats. If athletes wear, the proper equipment, spectators can become even more immersed by viewing the game from the player’s perspective. If virtual reality is going to be the next major technology in consumers’ homes, advertisements are sure to follow. Currently, marketers are getting their feet wet in virtual reality; their advertisements are more aimed at showing people the awe-inspiring abilities of virtual reality, as they should be. If marketers flood the virtual market with advertisements from the onset, there is a possibility that they will stunt the adoption of this new technology. Major companies such as Coca Cola, Volvo, HBO, Facebook, AT&T, and Nestle are researching and developing ways to create effective virtual reality ads. These companies are not yet sure how to marry advertisements with virtual reality content. The immersive experience is what will allow these advertisements to be so successful but at the same time, this is the reason why it will be difficult to integrate advertisements into VR. User experience could potentially be destroyed if they are immersed in a virtual reality movie and then suddenly into another virtual world featuring an advertisement. This could create stress and discomfort for the user. Imagine doing whatever you’re doing and then within a blink of an eye you are transported to another reality over and over again within the short span of a commercial break. One way this stress can be circumvented is to make the advertisements interactive and as a means to access the content. MediaSpike is one company that is creating in-game product placement ads. One of their advertisements allows virtual reality gamers to test drive a car through a city. Virtual test drive apps are an excellent way to merge advertisements with virtual reality. Incorporating advertisements into the unchartered waters of VR will be a challenge but with the right mix, marketing firms will find themselves under a waterfall of new revenue. Companies like Facebook are pouring money into virtual reality at an unprecedented rate. In 2014, Facebook bought Oculus VR for $2 billion. Today, mobile is the platform of choice, but tomorrow it will be virtual reality. Facebook’s investment in virtual reality is a strategic move to place it in a dominant position as consumer preferences gravitate toward virtual technologies. The list of companies trying to get a foothold in the virtual reality industry goes on and on. In less than ten years, the market for virtual reality content is expected to be around $5.4 billion while the hardware component is expected to reach as much as $62 billion. Superior training is one of the many reasons that the United States has the strongest military in the world. Currently, all three services use virtual reality for training purposes. The use of VR to train soldiers is only expected to increase as the technology becomes more economical and refined. Practice makes perfect; this saying has a completely different meaning when it comes to soldiering, and performance is a matter of life and death. Currently, virtual reality is used for flight simulation, battlefield simulation, medic training, and vehicle simulation. VR flight simulations help pilots to experience an unlimited supply of unique engagements. These engagements allow pilots to have a wide knowledge base that will allow them to make educated decisions when they enter live combat. Not only does VR help pilots obtain invaluable experience, it also reduces training cost stemming from aircraft wear and tear and fuel costs. VR also helps the military learn from its mistakes. 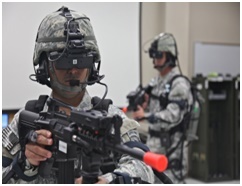 VR allows the military to react to particular scenarios economically and safely. Various strategies can be applied to a particular scenario in order to find out which strategy will provide the best outcome. Once a particular strategy is deemed the best course of action for a situation, it then can be added to the military’s knowledge database and disseminated to troops for maximum effect. The United States is currently facing difficulties attracting and retaining students in the STEM (Science, Technology, Engineering, and Math) fields, but virtual reality technology could change this. Close to half the students who peruse STEM degrees in college end up dropping out of their major. Many of these students choose to leave stem programs because these programs focus on theory and provide little hands on experience. VR systems could be used to make challenging and dry content more exciting and engaging. VR will allow engineering students to bring to life whatever they design. The pride and accomplishment that these students will experience from seeing their ideas come to life will provide the needed encouragement to complete their degrees. People may have different opinions on what engineering truly means, but at its core, engineering is simply the development of practical solutions to technical problems. Virtual reality will further decrease the cost associated with prototyping. Software designed by companies like Autodesk can help manufacturers simulate potential products two-dimensionally on computer screens, but there is nothing like actually testing out the product in a live environment. Ford Motor Company is leveraging VR technology to improve their designs. Ford is able to link VR technology right to its Autodesk CAD system to produce a virtual version of their prototypes. The virtual experience allows testers to recognize subtle design flaws, which can be quickly fixed. Stanford University’s Virtual Human Interaction Lab is making major strides in virtual reality technology. Stanford currently has a wide range of projects exploring potential applications for VR technology as well as understanding the potential psychological effects of this new technology. One project, Empathy at Scale, focuses on how VR technology can be used to teach people empathy by allowing them to walk a mile in another person’s shoes. While another project, Learning in Immersive VR, aims to find out how VR technology can revolutionize teaching and education. Stony Brook University is making headway in VR research. Stony Brook has constructed the world’s first immersive gigapixel resolution display. With more than 1.5 billion pixels, the Reality Deck will help scientist to develop advanced data visualization techniques as well as create a better understanding of how to manipulate massive data sets. Iowa State University’s Virtual Reality Applications Center is an interdisciplinary research center that is making considerable advances in VR technology. The center hopes to improve 3D sensing techniques by increasing the 3D sensing field of sensors. Iowa State’s research is also helping to improve the effectiveness of soldiers in combat by developing the HomCam, a helmet which has four cameras positioned around it. These cameras broadcast a 360-degree view of a soldier’s position over Wi-Fi, which can be viewed by an individual anywhere. Any soldier wearing this helmet will essentially have eyes in the back of his head. This technology will greatly increase soldier survivability in combat. Brown University’s Center for Computation & Visualization conducts virtual reality research with a focus on locomotion and navigation. Current projects include dynamic modeling of online steering, pedestrian interactions, multisensory control strategies, avoiding multiple moving obstacles, modeling mobility with peripheral field loss, integrating learned routes, path integration, and navigational strategies. At Arizona’s Laboratory for Immersive Visualization Environments, it is possible to witness cardiac musculature and pulmonary veins protrude from the center of a room. Wearing a motion sensory headset, users can view and travel inside a human heart. Being able to explore the human heart at this scale allows researchers to gain new perspectives and insights like never before. The University of Washington is developing virtual reality technologies that will help reduce the pain that burn victims experience. Despite large doses of opioids, burn victims experience excruciating amounts of pain during wound care, such as daily bandage changes, wound cleaning, staple removals, and etc. The amount of pain a person feels has a lot to do with their conscious attention to the pain. VR technology is being used as a way to distract burn patients so that they are not as focused on the pain. Many burn patients in VR now consider wound care as an annoyance, distracting them from their primary focus of exploring a virtual world. Virtual reality will transform the modern economy. The applications of VR technology will only be limited by people’s imaginations. Though this technology is promising, it is only in its infancy, it is currently at the brick-size cell phone stage. Companies who invest in VR research and development early on will reap huge rewards when VR technology reaches the iPhone stage. Federal and state R&D tax credits available for those developing VR technology.